Do you snore or have obstructive sleep apnea? *Apnea means you are not breathing. *Sleep Apnea with Snoring is worse than just snoring. This appliance is worn on teeth or can be supported by dental implants; it is not worn in your throat. This is a machine with a mask that is worn on face while sleeping. Snoring is a sign of a breathing problem and is different and distinguishable from Sleep Apnea. Snoring occurs when the airway is partially blocked by jaw / tongue / throat / muscle tone issues, whereby the inhaled air is forced through a smaller opening, creating noise (snoring). Sleep apnea is complete blockage. Snoring can affect your quality of life and can be embarrassing or inconvenient. Snoring can cause problems in relationships when perhaps the partner’s earplugs or their pillow-over-the-head isn’t enough anymore. If you snore, you may not have sleep apnea. For many, snoring is a sign of Obstructive Sleep Apnea (OSA) – a serious medical problem. Over 18 million Americans are diagnosed with OSA. OSA occurs when the muscles around the throat /airway collapse completely, blocking airflow to the lungs. Oxygen supply is cut off to the body and brain, sometimes for a long time – even hundreds of times a night. The obstruction persists until the brain awakes (arouses). The brain may awaken, but you may not, and are unaware. Your sleep architecture and sleep stages are disrupted (Stage 1, Stage 2, Stage 3 and REM sleep). Often your brain awakens, but you are unaware this is happening. Sleep Apnea is obviously more complex than just loud snoring. Sometimes you may awaken unexplainably, perhaps with air-starved panicky gasps and in “fight-or-flight” mode. You stay in Stage 1 or 2 sleep …unhealthy! With OSA, this cycle repeats with you falling asleep, airway muscles relaxing, airway then collapsing, you unconsciously awakening, sometimes with a gasp. This can happen hundreds of times a night, which prevents a restful night of sleep because of oxygen deprivation (hypoxia). Hypoxia happens, and damage occurs over time. OSA can destroy your health a number of ways. Since you don’t fully awaken, you are not aware this is happening. Already Wear C-PAP? Can You Relate? Are You Undiagnosed with Sleep Apnea? Have you stopped using your C-PAP? Are you struggling with C-PAP claustrophobia? 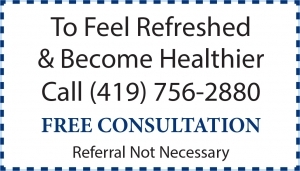 Are you feeling exhausted or have headaches for no apparent reason? Do you feel unattractive to your bed partner while wearing C-PAP? Does your partner elbow or tell you to roll over, waking you because of bad snoring or gasping? Do you sleep in different rooms away from the snoring or obstructive partner? Does the C-PAP head strap pull your hair? Is leaking air blowing on your partner’s face? Do the C-PAP straps leave marks on your face or need adjusting a lot? Do you have a dry nose or sore throat? Up to an estimated 60% of sleep apnea patients cannot tolerate or choose not to use their C-PAP device. Severe sleep apnea patients may benefit by simultaneously wearing C-PAP with an oral appliance. Patients who wear C-PAP, but do not travel with it, find an oral appliance to be a travel alternative. 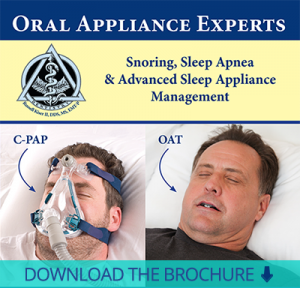 Here at ORAL APPLIANCE EXPERTS, we offer Oral Appliance Therapy (OAT) to manage sleep apnea and snoring airways. We work with your physician, embracing that relationship in a non-competitive manner, while working with your medical insurance to manage apnea. Physicians become part of our oral appliance team to co-manage this potentially deadly problem. Medical insurance is often billed for OSA / OAT (Obstructive Sleep Apnea / Oral Appliance Therapy). What Does This Have to Do with the Dental Profession? Medical insurance often pays for evaluation, oral appliance therapy and follow up. Here at Oral Appliance Experts, we work with your physician and medical insurance. If you are diagnosed with Obstructive Sleep Apnea, we will work with your physician to determine if C-PAP or a custom adjustable oral appliance is right for you. We want to meet you so we can understand how to help you, individually. I have to see inside your mouth so we know how to help you with Oral Appliance Therapy (OAT). We fabricate the most comfortable oral appliance possible for you to treat your apnea/snoring. OAT is an alternative to C-PAP for OSA and OAT can complement C-PAP in severe cases of OSA. 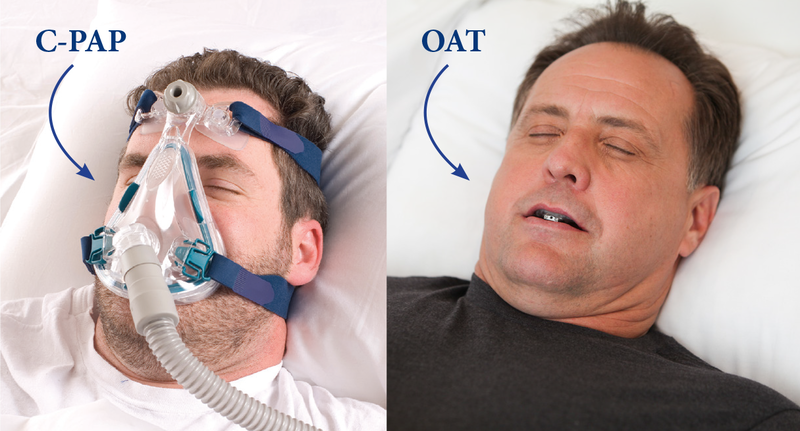 Today, more and more people are having OAT to manage OSA and/or simple snoring. An oral appliance can be an alternative to C-PAP machines or airway surgery.